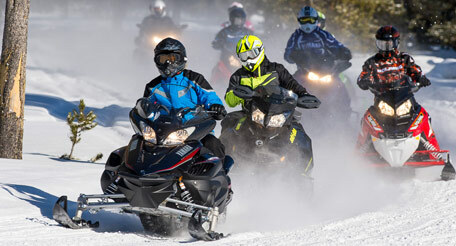 Collection of research studies related to snowmobiling impacts including economics, personal exposure, recreation conflicts, snow and trail conditions, environment and wildlife. This library is based upon Research Studies Related to Snowmobile Impacts which was developed by the American Council of Snowmobile Associations with financial support from the Federal Highway Administration – Recreational Trails Program. The Research Studies publication provides abstracts, summaries and web links for over 190 impact studies related to snowmobiling, approximately 150 of them can be downloaded in their entirety from this library. Information presented through this scientific research can be an important tool to help assist trail providers in negotiations for new or continued access. Whether old or new, these studies have relevance to present day discussions about snowmobiling access. While not every study applies to every local situation, many can be credibly extrapolated for use where local situations are similar to a particular study’s settings. All abstracts are presented as direct cites from study authors. Information is organized alphabetically by impact topic, and then listed from the most recent to the oldest studies with key findings highlighted. Important perspectives can be gained by following the progression of knowledge forward in time, from old to new, as impact topics gain perspective with new research that either dispels myths or better defines real impacts. This compilation represents the ‘best available information’ about snowmobiling impacts. Public land managers often use ‘best available information’ as their standard for analysis of impacts, particularly when local data are not available. Consequently this information should be shared and used to help land managers make informed decisions about snowmobiling access. A large number of snowmobiling studies date back to the 1970s and 1980s – when snowmobiling was fairly new, growing rapidly in popularity, and concerns by land managers and citizens about this new winter activity were high. This early research often disproved concerns, showed snowmobiling impacts were far less than had been feared, or concluded additional research was needed to more fully analyze theories about alleged issues. As positive answers were found, the focus of recreation impact research gradually turned away from snowmobiling to other activities deemed to be higher priority concerns. Interest in snowmobile impacts resurfaced in the late 1990s and early 2000s when public debate flared over continued snowmobile access to Yellowstone National Park. With snowmobiling under an intense spotlight, numerous new snowmobile studies were conducted through a series of winter use environmental impact statements and on-going monitoring of snowmobile use. While snowmobiling in Yellowstone is quite different from most other snowmobiling areas, new Yellowstone information is nonetheless useful for informed inferences about potential impacts elsewhere. While the rapid growth of ATV use in recent years also generated new ATV/OHV impact studies, this compilation focuses solely on snowmobiling – except for a few examples where OHV-related deer studies reached similar conclusions as what snowmobile-deer research had decades earlier. Consequently – even though ATVs and snowmobiles have distinctly different operational characteristics – some aspects of their use are similar enough to sometimes make informed inferences on some topics. Click on each impact topic below to view chapter sections and to download available research reports.